The man that needs no introduction, Jake von Slatt, who was one of the Guests of Honor, talks a bit about his experiences, including the panel he co-presented with the awesome mistress of the ExoSkeleton Cabaret Libby Bulloff about Queering Steampunk Fashion. Donna Prior, the Games Chair, talks a bit about the tabletop, miniature, and LARPing adventures that took place this weekend. 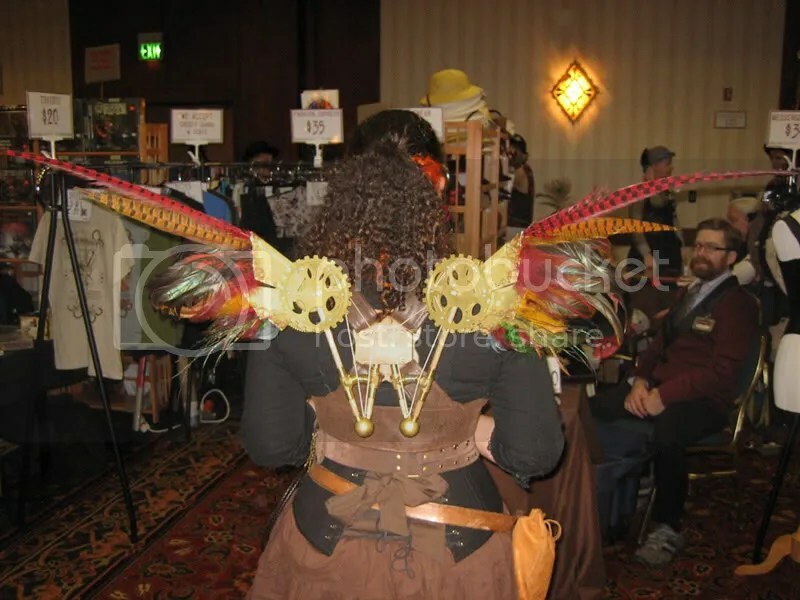 Staff member Kevin Steil, the Airship Ambassador, already provided a gigantic round-up and review of the SteamCon II media coverage, but also gives an exclusive report about his Steamcon experience. Justin Stanley (aka Emperor Justinian Stanislaus), known to most as the Emperor of the Red Fork Empire, gives an on-the-ground scoop in his attendee report. And. as always, the Comments section is open for your own links, photos and more about your Steamcon experience! Interested in being featured as a reporter or a photographer for an upcoming convention? You know where to find me. This year I had the distinct pleasure of attending Seattle’s SteamCon II as the “Artist Guest of Honor.” I had come to Seattle last year for the first SteamCon and enjoyed it greatly so I was very happy when I received the invitation from Diana Vick to be a GoH this year. Read on in “”Music, Merriment, and Men in Skirts”. Read on in “A Gaming Point of View”. 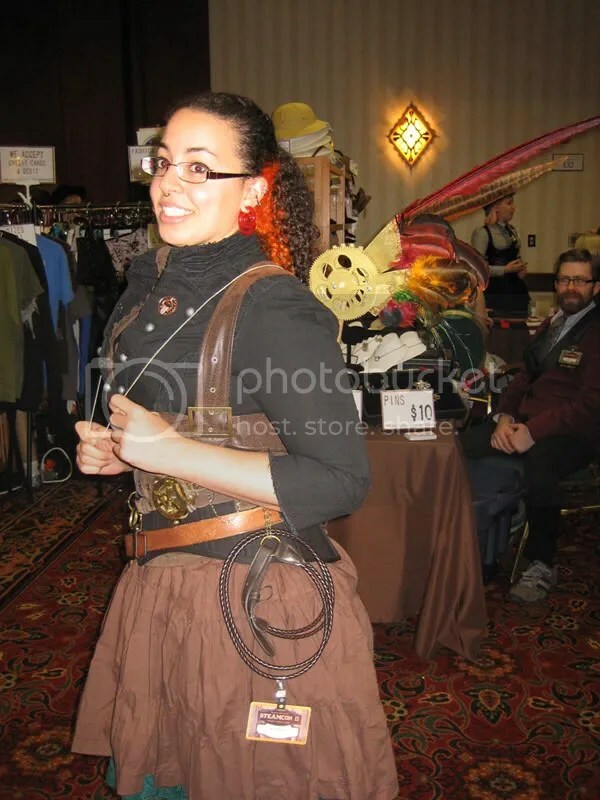 SteamCon II: Weird Weird West, was an amazing convention in Seattle, Washington on November 19-21. With almost 2,000 guests for the weekend, the convention offered over 200 hours of programming ranging from discussion panels to continual music performances, high teas to the art show. 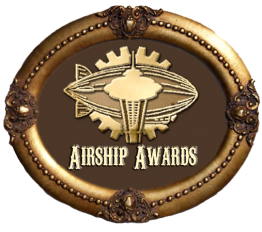 Read on in “Travels with the Airship Ambassador”. I flew in to Seattle on Thursday, at baggage claim I soon learn that my bag that I checked that had all my clothes and what have you did not join me. So after dealing with that I met with Lord Baron Joseph Vourteque of Steampunk Chicago and took the shuttle to the hotel. Read on in “Another Adventure in the World of Steam”. 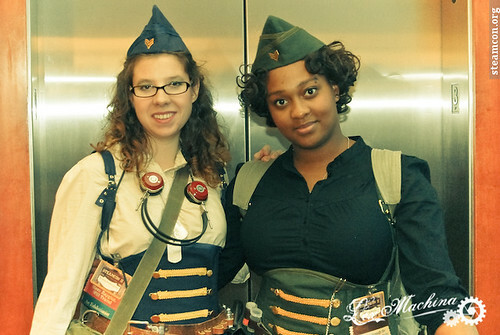 Many folks posted wonderful photos over on the Flickr SteamCon II group and there is also photographer Chris Hunt’s beautiful fashion shots here on his blog. Some notable images are below; please see the end for photographer bios. The most beautiful wings. Image courtesy of Alison of Velvet Mechanism. Click for Flickr. The back of her wings. Image courtesy of Alison of Velvet Mechanism. 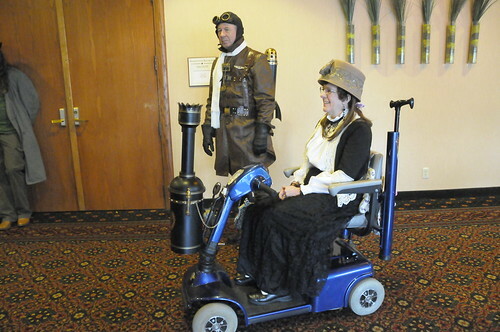 Steamcon II: Steam Engine and Engineers by Laura K. (tricyrtis.hirta on Flickr). Click for link. 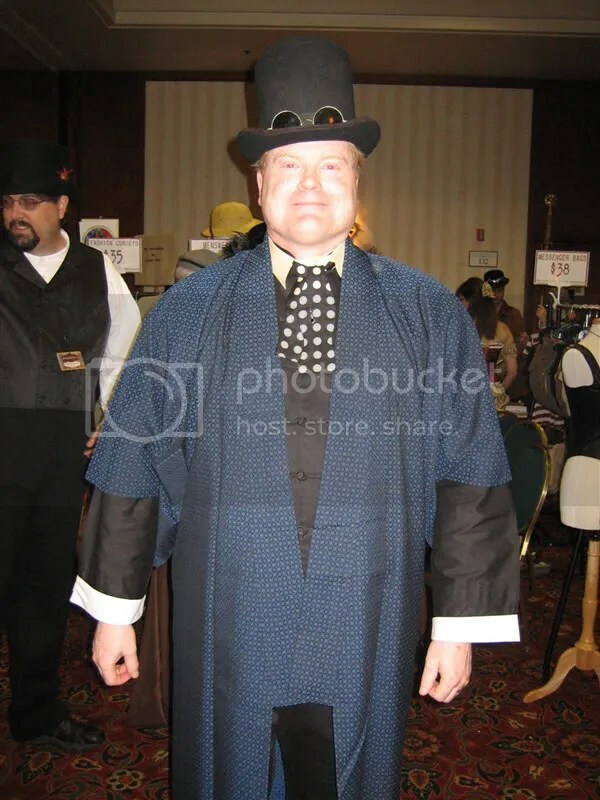 A gent in Japanese-influenced steampunk. Image courtesy of Alison of Velvet Mechanism. Click for Flickr. A striking portrait. Image courtesy of Michael Hinsdale. Click for link. Mechanical Ostrich Rider. Image courtesy of Laríssa, on Flickr. Click for link. Rich festive colors. Image courtesy of DragonWehr, on Flickr. Click for link. Two dieselpunks. Image courtesy of Lex Machina. Alison of VelvetMechanism.com sells steampunk jewelry and accessories for men and women. DragonWehr’s photography can be viewed on Flickr. Laura K. is a photographer based in Washington. You can view more of her photography on Flickr. Larissa Sayer is an artist, photographer, and geek-of-all-trades from Vancouver, BC. When she’s not gallivanting about town in crazy costumes, she posts photos on Flickr and occasionally remembers to feed her oft-neglected art blog. Lex Machina is a photographer and digital artist from Detroit, MI. She shoots portraits, fashion and events, which illustrate and celebrate the seemingly endless subcultures that make up the modern counter-culture. You can see more of her work on Flickr. Michael Hinsdale is a photographer based in Washington. You can view more of his photography on Flickr. 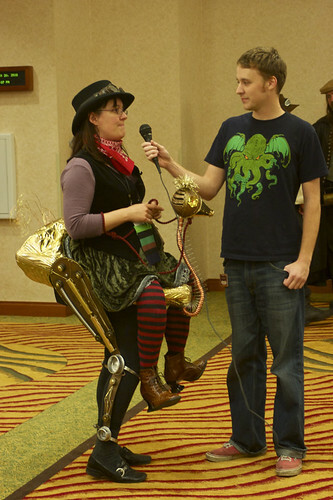 Thanks for the feature on Steamcon II in your rather splendid blog! Sadly I was away which is frustrating as its right on my doorstep! The Mechanical Ostrich Rider looks like a must-have!